Elliot Silver answers five questions about rebranding his blog. Elliot Silver has an occasional series on his blog called “5 with…” in which he asks someone in the domain industry five questions. In light of Elliot’s rebrand from ElliotsBlog.com to DomainInvesting.com this week, I thought it would be a fun idea to turn the tables on him. DNW: When did you initially decide it was time to change your blog’s name, and what were the key reasons? Silver: I had thought about changing the name of the blog for over a year, but I was only going to do it if I got the exact domain name I wanted, which is DomainInvesting.com. I thought about other domain names, but rebranding has risks, and I only wanted to do it if the risk would be offset by upgrading to a great brand name. I also think the personal branding is more limiting than DomainInvesting.com. I like the idea that I can ask other experts to contribute without worrying that readers will confuse their articles for mine. DNW: I see that you bought the domain name from fellow domain investor Lonnie Borck. How did the conversation and negotiation go? Silver: I talk to Lonnie all the time, and I mentioned the idea of buying it to rebrand my blog in early 2012. Lonnie used it for his own company and had plans to create a blog. We discussed it every once in a while since then. About a year ago, I made him a serious offer, and he declined because of his plans for it. A couple of months ago I made him another offer, and we were able to work out a deal. I am pretty sure Lonnie realized that it would benefit me more to use the domain name than it would benefit him to start blogging. I am quite sure the sale was more about helping me than it was about the money for Lonnie, and I am very appreciative of him for that. DNW: What concerns did you have about changing the domain name? Silver: My concerns were primarily related to search engine rankings. I read about the issues Nuts.com had when it changed its url, and I didn’t want to have the same issue, especially because my blog is advertiser supported. I was also concerned that visitors might not like the idea of me changing the branding from a personal blog. DNW: Given those concerns, what steps did you take to make sure the transition went as smoothly as possible? Silver: Luckily, my blog doesn’t rely on search engine traffic as much as some of my other websites, so it was not as great of a concern as it could have been. I hired Everspark Interactive to help with the onsite optimization and site migration figuring any traffic loss due to the change could be mitigated by cleaning up some issues that were present before the shift. That is still a work in progress. Regarding the perception of the brand change, I plan to continue sharing advice and insight, and hopefully people continue to visit. So far, most of the feedback has been positive, and I appreciate the support. DNW: What has been the biggest surprise about the process of changing your name? Silver: There haven’t been all that many surprises. When I first decided to make the url change, I did quite a bit of research on the process, and drafted a list of things that needed to be done to make it a successful change. I worked with Tia Wood to ensure that the critical elements were handled before or during the switch, and I went through my list as the change was being made. I also made sure the different members of the team that helped with the move were in contact with each other before, during, and after the move. I couldn’t have done it without their help. I was also surprised at the amount of support I received from within the domain investment community. That really made my day. Eric Borgos on why he’s selling domains, help the tornado victims, and a “cool” rebranding. Here are a few domain stories I read today that I think are worth reading. Eric Borgos has published an interesting perspective about 10 Reasons Why I Am Eager To Sell My Domains. Last year Borgos’ company had sales of $1.25 million, and domain sales were the company’s largest source of income. Elliot Silver, DomainBoardroom.com, and Escrow.com have teamed up for a charity auction to benefit Oklahoma tornado victims. All proceeds will go to the Red Cross in Oklahoma City. Items in the auction include domain names as well as an SEO audit by Bill Hartzer, a gift certificate to Bobbleheads.com, and a guest post on ElliotsBlog. Bidding takes place via comments on the blog post, so Elliot is going to have fun keeping track of this one. Kudos to Domain Advisors for rebranding as Igloo.com. Whenever I saw an email or tweet from Domain Advisors, I had to think about who was behind the company. Domain Advisors or Domain Holdings? If Domain Holdings, which of the two companies named that? Or is it one of the other many companies with Domain + some common term? Igloo.com is memorable and shows that the company “gets” domains. A look at what domain bloggers and news sites are writing about this week. 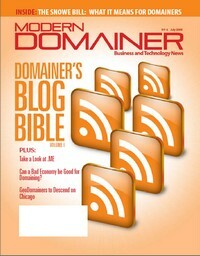 Various domain news sites and bloggers have written some great articles this week that are worth referring to. Demand for new gTLDs – Michael Berkens beat me to writing a story about ICANN CEO Paul Twomey’s comments about new gTLD demand. Twomey refers to demand as demand by people who want to launch new TLDs, not people who want to actually register them. Change your Passwords – Elliot Silver discusses changing your passwords after returning from a trip. Not domain news, but it’s very important. My added input: instead of using public wifi, get a cellular network modem card. Also, use https:// when connecting to Gmail. Internet Commerce Association helps domainers in VeriSign court case – Domain owners scored a major victory against VeriSign last week. Internet Commerce Association explained its role on its web site. Dan Warner leaving Dark Blue Sea – A familiar face in the domain name industry is moving on, but will still be in the industry. Despite economic turmoil, I had one of my biggest sales months ever. Domain parking revenue is down. The world economy is on the brink. The Dow dropped another 350 points today. Yet for some reason, I had one of my top three months ever for domain sales in September. Those include sales at the Aftermarket.com auction and sales to someone trying to diversify his investment portfolio into domain names. The TRAFFIC auctions were fairly successful, too. Earlier today I read a blog post from good friend Elliot Silver about how he’s not aggressively buying domains anymore and is turning his attention to maximizing his current portfolio. That makes sense. He needs to properly monetize some domains that he undoubtedly paid a lot of money for (e.g. FrenchRiviera.com and Burbank.com). There are plenty of people in Elliot’s shoes who have seen sales drop and are tightening ship. I’m doing the same thing — not buying as much, but keeping my eyes open for bargains. Warren Buffett has a keen eye for buying low and has thrown $8 billion into the hat over the past week. He has a shrewd eye for deals, and so should domain investors. OK Andrew, so what’s the point? Well, my sales last month were strong and perhaps it was just an anomaly. But stay focused on the underlying value of domains, keep your eyes open for deals, and work to maximize your portfolio, and you’ll do just fine.